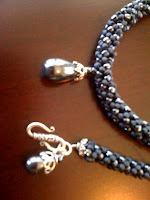 Here are better pics of the rope set with Hematite dangles that I posted before. This is the Russian Spiral Stitch, as printed in Seed Bead Stitching by Beth Stone, Page 82. I know I need a better camera...my iPhone will just have to do for now. Done with same color mat and glossy beads. The mat beads are 8, the glossy beads are 6. 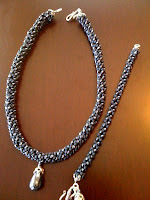 I used heavy gauge fishing line for the necklace which gives it some really nice coil like body to it. I didn't want that stiffness in the bracelet so I used beading thread. This is one that I get asked to make quite a bit.